One of life's simple pleasures. Turon harks us back to the old days when life was not very complicated, when the neighborhood magtataho was still greeted by glee and kids grabbing bowls for their share of the rich soya concoction. Turon, along with banana and camote cue, reigned supreme as the street food of choice. Turon is even simpler to prepare. All you need are cooking bananas (which we call saba), brown sugar, lumpia wrapper (available at the Asian store), and frying oil. Although in our case here in New Zealand, cooking bananas are more difficult to come by so I grabbed some when I caught the news that it was available at New World. It was still dark green, though, and so we placed it in a warm place for it to ripen properly. It took 2 weeks for it to become bright yellow, and then it was ready for greatness. Peel off the bananas. Slice into three lengthwise. Spread some brown sugar on a wide plate and coat the banana with the sugar by rolling the pieces over it. Wrap with lumpia wrapper. You can put in two pieces if you want. To make more, just place one piece. Add the optional langka at this stage; a thin strip of this fragrant fruit will do nicely. You can also cut the lumpia wrapper into two if you're only placing 1 piece per wrapper to maximize its use. Fold the sides, then roll, then dab the edge with the water to seal. Pour cooking oil into the pan, enough to partly submerge the turon pieces. 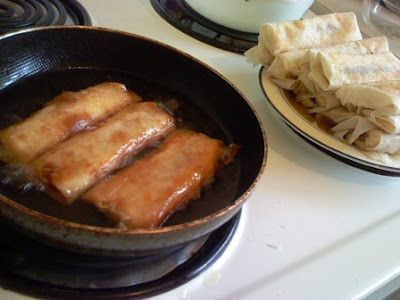 Heat up the oil, then reduce to medium heat and fry the turon, turning occasionally to brown both sides. Let sit on a strainer to drain off excess oil and cool off. i love turon too! but my faves are camote- and banana-q! esp. if it has lots of sugar!! YUMMM! We love our banana and camote cue with dari creme drizzling on it and salt sprinkled! Have you tried that?